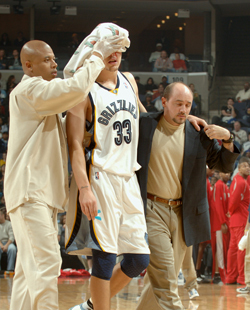 Now that the NBA is back, the last thing we want to see is a player injured and out for the entire season. Yesterday (December 12), the league announced a new concussion management program. Each year, players will get a baseline neurological exam and cognitive assessment. If a player gets a concussion during a game, he’ll have to go through several tests before he gets the OK to return to the court (CNN). “A concussion is a type of traumatic brain injury, or TBI, caused by a bump, blow, or jolt to the head that can change the way your brain normally works. Concussions can also occur from a fall or a blow to the body that causes the head and brain to move quickly back and forth” (CDC). Remember when the Situation headbutted the wall and gave himself a concussion? What an idiot. He looked pretty out of it. Symptoms of a concussion include difficulty thinking or remembering information, headache, fuzzy or blurry vision, irritabiltiy, and sleeping problems. Click here for the complete list of signs and symptoms. The Situation tried to tough it out, but he ended up going to the hospital. And it’s a good thing he did. The scary thing about a concussion is that symptoms may appear right away or they may go unnoticed for days or months after the injury. If you or someone has a concussion, contact a doctor asap. “Each year, U.S. emergency departments (EDs) treat an estimated 173,285 sports- and recreation-related TBIs, including concussions, among children and adolescents, from birth to 19 years” (CDC). The CDC explains that though the concussion symptoms are mild, the injury can significantly impair an individual’s memory, behavior, learning, and/or emotions. Inform the athlete’s parents or guardians about the possible concussion and give them the fact sheet on concussion. Keep the athlete out of play the day of the injury and until a health care professional, experienced in evaluating for concussion, says they are symptom-free and it’s OK to return to play. So whether you play professionally, for a school league, or an IM team, remember that safety comes first! Make sure to follow the rules and practice good sportmanship! No one likes a sore loser. In the spirit of Christmas, please enjoy this rendition of the 12 days of Christmas by the Chicago Bulls.